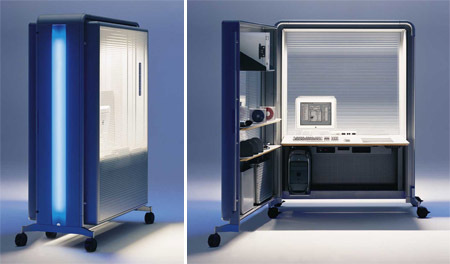 The St@ndby Office, A Portable Cubicle | OhGizmo! Perhaps useful if you’re managing a fleet of evil telemarketers and having a completely mobile, relocatable-in-an-instant “boiler room” can help you stay one step ahead of the law. Whatever you decide to do with these, they seem to me to have quite the potential for usefulness. They’re modular cubicles-on-wheels called Standby Office, designed by the German studio K?nig+Neurath. These offices are made from steel, aluminum and wood and measure 190 x 146 x 74 cm. They come with an integrated WiFi access point, so all you have to do is add a chair and computer. Your fleet of evil telemarketers better be good at separating grandma from her money though, cause each of these will set you back a cool 5,000 Euros. They’ll hit the market in Spain in the next few months. Actually, I’m a technical trainer and I am required to be able to take my 2 PC’s and all my other teaching materials from classroom to classroom and this would be FRIGGIN GREAT! Currently we’re using these little push carts, but after a couple days of use in any one spot they become a complete tangle of wire deeply rooted in place. Being able to move the entire desk and a considerable amount of shelving all at once by just unplugging power and network would be wonderful! This is definitely getting forwarded to my supervisor. 5,000 euros for just that?! ?